24 x 8 Stamped Steel Baseboard Return Grill - Pewter Discounts Apply ! Buy this modern return air grill with a stunning pewter finish to revamp your old baseboard returns. This beautiful return air grill has a durable plated pewter finish that will stand up over time. The finish on these baseboard grilles is a nice pewter/soft silver, making them perfect for remodeling or new construction. This hard to find return grill will fit a 24x8 hole. The grill also has a 7/8” margin turnback and 20 degree angled fins that are spaced 1/3”. The baseboard return does not have a damper to allow for continuous air flow. Not only are these baseboard returns decorative, they are also sturdy. The return air grills have a steel core, and are a single piece construction giving them additional strength. Included with the return air grill are screws and predrilled holes for easy installation. Looking for a corresponding pewter return air grill for your wall or ceiling? You can also get this baseboard in white plastic, perfect for areas with high humidity! The industry standard is to measure the hole size to find the fitting dimensions for your return vent. This baseboard grille will cover a 24”x 8” hole. The faceplate dimensions are 25 1/4 x 9 1/4 inches. 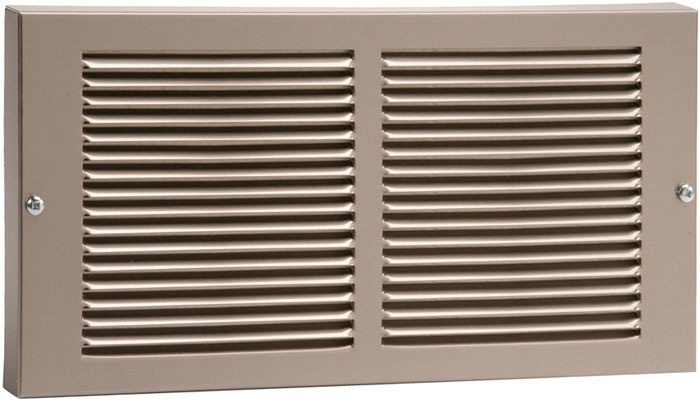 Try this return air grill today and see what a these pewter baseboard returns can make.